Process industry is continuously exposed to risks like fire, gas leak, explosion, injuries and accidents etc. which could cause fatalities or disabilities, environmental damage and financial losses. Safety Instrumented System (SIS) is one of the most important layers of protection against occurrence of accidents and hazards in process industries. It is designed to prevent or mitigate hazardous situation and ensure safe conditions when violation to preset parameters is noticed. Safety performance criteria for SIS is defined by Safety Integrity Level (SIL) of the identified loop. SIL is an instrumented safety system that is designed in accordance with the IEC 61508 and IEC 61511 standards. There are various safety studies which are carried in the process industries such as HAZID, HAZOP, HAZAN, QRA, etc. SIL study is also one of the safety studies which is carried out to prevent hazard in process industries. Generally SIL study is carried out after the HAZOP study is completed for a project. There would be a question on the need of SIL study when HAZOP is already conducted.. HAZOP study makes the process as a whole robust or reliable by adding redundant instruments, additional alarms etc. But HAZOP study does not address the problems of required reliability of the system provided, e.g. - Instrument provided for additional alarm may not work when required to generate alarm. 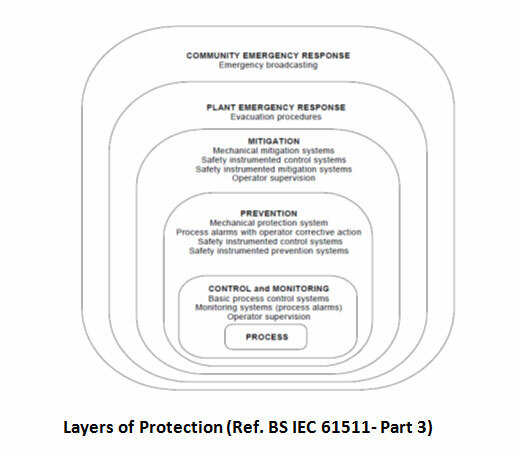 There are various layers of protection, some are for preventions of hazard and some for mitigation of hazard. As we can see from the figure below, SIS is part of Prevention as well as mitigation of hazard. - SIL identification : SIL level 1 to 4 are identified for each SIS loop. - SIL verification : Under this stage it is verified that the instruments procured for each SIS loop are meeting the SIL level identified for the loop. - SIL validation : In this stage it is validated that the system procured is as per safety requirement specifications, safe installation and commissioning and proof test interval for each element of SIS loop is defined. SIL identification and SIL verification studies are carried out during detailed design engineering for any project. Whereas SIL validation is carried out at site after erection of all components of the SIL certified loop. SIL solutions are certainly not always most effective solution for decreasing risks. Also the instrumentation components needs to be maintained and tested at periodic intervals, SIL solutions are therefore to be utilized judiciously. TCE has in-house capability and expertise to support client needs on SIL identification as well as SIL verification studies.